I few days ago received an unexpected delivery: the Cloud Book by brandbook. It’s an unusual notebook that brandbook sent to several bloggers to promote it1. Brandbook‘s main business is manufacturing custom-made and designed notebooks. Their notebooks are mainly for business customers, but last year they launched their notebook line nuuna, aimed at consumers. The Cloud Book is one of nuuna’s products, not intended to be used as an ‘orderly notebook’, but as a notebook that is supposed to help your creativity. To support this task the pages sport different cloud photos. The notebook itself is sky blue with a bright orange elastic band. I was told that the cover is made from Cutoron and that the paper used is Tauro paper2. 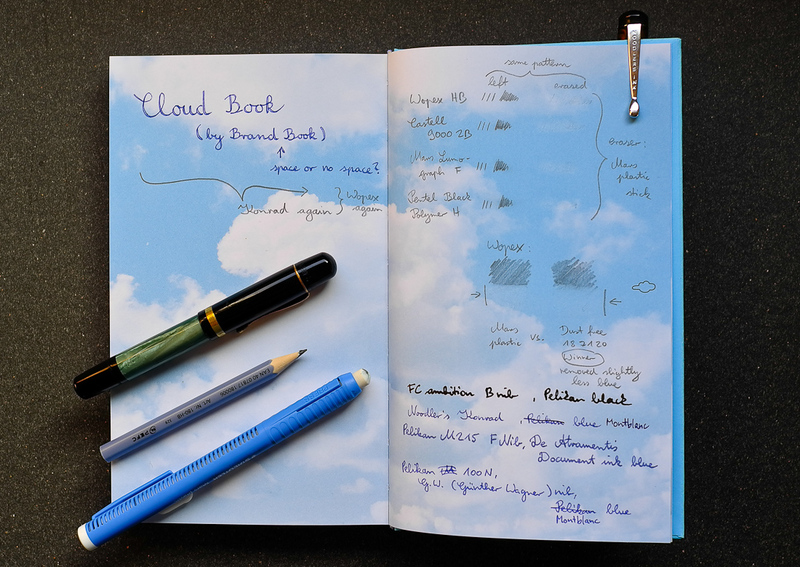 The first thing to notice when using the Cloud Book is that erasing graphite from the pages will also remove some of the colour used for printing the background picture. Some erasers are better than others. The dust-free erasers I used were particularly good at keeping the background photo ‘undamaged’. Another thing, the Tauro paper isn’t exactly what I would call ink loving: it absorbs ink more easily than many other types of paper. This means that wet fountain pens will cause some bleed-through, but the dry fountain pens I tried were safe3. The paper feels a bit rough, but graphite and ink are easily visible on the paper. I mention this because some papers with a similar feel need fairly soft pencils to produce a dark line, but this paper will also be satisfied with harder pencils. How many shibbloths can you find when you enlarge the picture. I think there are at least three obvious ones. I really like the idea behind the Cloud Book, but at work or at home I’d usually only write something in a notebook if I want to keep the information I write down – so the concept of using a notebook as a tool for creativity or to satisfy your play instinct is slightly alien to me – I’d usually use the reverse of an old calendar sheet or of an old sheet of paper if I want to scribble around… but now that I have the Cloud Book I’ll try to use it as intended. 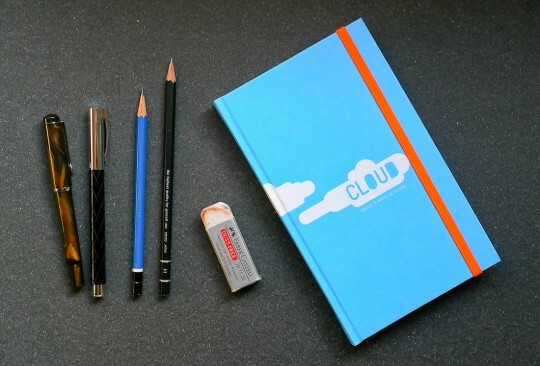 The Cloud Book‘s RRP is €17.90 (~$23.30; £15.50) and it’s made in Germany, like all brandbook notebooks. Price and exchange rates: March 2013. I’d like to thank Carlos Monteiro Lanca from brandbook who sent me the Cloud Book free of charge. The rare-ish GW nib of the Pelikan fountain pen used for the second picture has the honour of being shown on Werner Rüttinger’s Pelikan page. The bought both, the Faber-Castell Guilloche fountain pen and the De Atramentis document ink, for an amazing price. The fountain pen was only a bit more than €20 at Amazon, but after I ordered it the price nearly doubled. The De Atramentis document ink was very cheap at Pure Pens, much cheaper than what you pay at the manufacturer – probably a combination of it being the old price before the price increase and a good exchange rate when they imported the ink. One last thing: users of the Cloud Book can send a photo or scan of their favourite scribbles to brandbook / nuuna for a chance to win a a selection of notebooks from nuuna. Thank you for showing it – it looks really nice. However, since I have tried to contact brandbook twice to inquire for an order of custom notebooks but haven’t received a reply I am somewhat reserved towards their products. It’s a shame that they didn’t reply – and it’s even surprising when thinking about the fact that their business is based on custom notebooks. Even if the numbers you had in mind didn’t add up for production (i.e. not enough notebooks) they should have replied. I’m not sure the move to social media is too useful either. I think you are more likely to get an answer there, but it will be an acknowledgement of your interaction more than dealing with your question or statement. If I think about the posts I see from some companies (not stationery companies, luckily) they definitely give the impression of not thinking too highly of their customers and the same theme is repeating again and again: trying to force customer interaction by asking simple questions without then actually reacting properly to the replies. I think you are right about social media. To me, interaction (and for companies advertising) is at its core, not a two-sided communication about facts. Well, at least at its best – most of the time the whole caboodle is nothing more than a silly circus to me. The resellers are doing so much better than most big companies, but there is some randomness to it as you had some good experience with companies I had bad experience with and the other way round. About the Cloud Book: I just noticed that Stone Marketing is selling the Cloud Book in the UK for £15.